A quick trip to Habitat ReStore. Most people have heard of Habitat For Humanity and the fabulous work that they do, but did you know that they also have stores? Habitat ReStores help to raise money to fund HFH projects and have locations in 49 states. Yesterday I met up with Barbara from Chase The Star to explore one of our local stores. I met Barbara when she attended The SoCal Social last year and got to say a quick hello when I bumped into her at the CHA trade show. We are both going to the SNAP Conference, and since we live fairly close to each other, we thought it would be fun to have a thrift shop day. Poor Barbara! She still smiled beautifully even though the wind blew some of my hair into her mouth. Sorry! We had a great visit and had fun checking out the store. There are tons of building supplies: shutters, windows, doors, cabinetry, lighting, all sorts of things… check out all of this great tile. 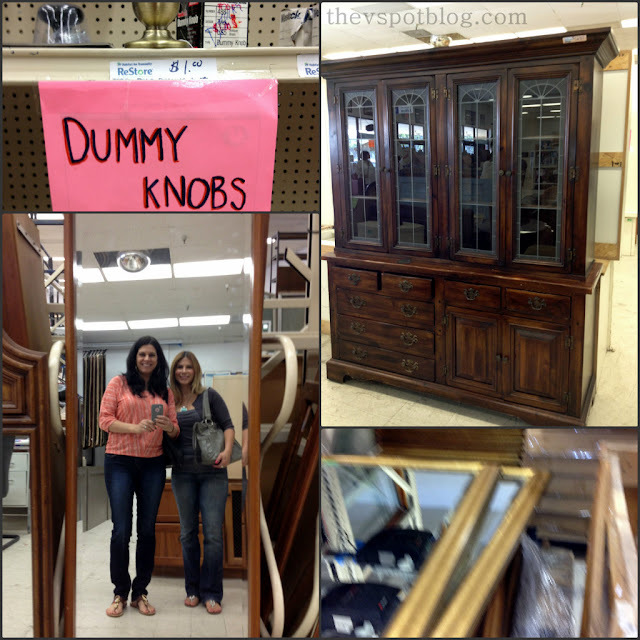 They also have furniture, knick-knacks, sinks, strange things, art work and (at this store) stacks and stacks of mirrors. sorry for the blurry photo of the mirrors… I just got so dang excited. We thought it would be fun if each one of us got one and re-did it. It will be fun to see how the same lamp will end up looking totally different and them share how we did them. The other thing that came home with me…? This baby. Solid wood… $49. I have plans for him. Hopefully I will show you both the bookcase and the lamp very soon. Do you have a Habitat ReStore near you? Do you love it? I LOVE the ReStore! I get good deals and it is a great store to support 🙂 A win win for sure. I can’t wait to see what you do with both your new treasure! WOW! I know there is one near me (just happened to spot it the other day), but had no clue they had this kind of stuff!! Where is the one that you went to? Looks like fun! My Dad was just telling me he wanted a lamp in that very same shape… I too live in So. Cal…Where is this one located? We have a ReStore in the next town over. Can’t go often as I’d like as it’s 40 miles away, but I got my planter I just made over and a piano bench there. Can’t wait to go back!! Can’t wait to see how each of you makes over your lamps! More importantly, I’m almost crying that you are able to wear sandals, while we are getting snow this morning! Not fair. Harumpf! I’ve never been in a ReStore! It looks fun and I bet you had a blast with Barbara! She’s so awesome. I can’t wait to see what you do with your finds!! There is one pretty close to me– it is out by the thrift stores I like to go to but I have not gone in it yet, definitely will stop in next time! I love my Habitat Restore in South Carolina. I stop there at least twice a week. They always have interesting items. This is my favorite place to donate my furniture and housewares too. My new favorite thing: SnapBox Prints. Perfect for gift giving. SNAP Conference Wrap-Up: Blogs you should be reading. Want to spend more time outside…? Is your patio ready? Refreshing the house for spring. Lighten up, already!